Campbellsville University will host its sixth annual Derby Rose Gala on Monday, April 14, with live TV and radio production as well as live streaming through www.campbellsville.edu. "The gala is an important scholarship fundraising event, generating close to $106,000 for scholarships in the past five years," Benji Kelly, vice president for development, said. The gala is a black-tie optional event with a guest speaker, gourmet meal and silent auction. 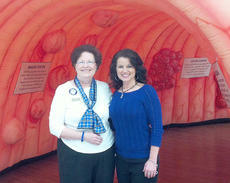 Kentucky Cancer Program officials are encouraging everyone to Dress in Blue, the color of colon cancer awareness, and come to Walmart in Campbellsville on Friday, March 14, to tour the "Incredible Colon." The display, at 20 feet long and 10 feet wide, is so large that visitors can walk through it and see educational displays inside. The special event is as part of the fifth annual nationwide campaign to promote lifesaving colon cancer screening and March as National Colon Cancer Awareness Month. A Taylor County Red Cross team has formed and training will soon be offered to certify those who have volunteered as members. According to Michael K. Humphress, a Campbellsville resident involved with forming the team, there have been about 20 people who have expressed interest in forming a Red Cross group in Taylor County. A training session has been scheduled for Saturday, March 8, from 9 a.m. to 4 p.m. at Campbellsville Civic Center.